A little boy, being asked what forgiveness is, gave the beautiful answer: "It is the odor that flowers breathe when they are trampled upon." And always remember that this is what best describes forgiveness. To many people, to forgive is the hardest thing to do especially those that have been injured by another person big time. However, it is also the best thing that anybody can do for another to personally obtain genuine peace and joy in one’s life. On the other hand, inability to forgive imprisons one soul in painful resentment and utter despair. It is a decision that no one can make for another. A deliberate choice must be made to do so. Most importantly, it is given not asked. Recently, I came across a BBC news article that discusses forgiveness: “So what does true forgiveness really mean? And how can it be achieved? Throughout history, forgiveness has often been seen through the prism of religion, rather than of science or psychology. On Good Friday, the Bible says Jesus Christ said "forgive them Father for they know not what they do" as he was on the cross.” Jesus walked what He taught even at the cross. It wasn’t easy but He did it to the amazement of His enemies and to be imitated by His disciples. Jesus taught it plainly to His disciples when Peter asked Him about it: “Then Peter came up and said to him, "Lord, how often will my brother sin against me, and I forgive him? As many as seven times?" Jesus said to him, "I do not say to you seven times, but seventy times seven” (Matthew 18:21-22). Forgiveness is a Christian principle that MUST be applied by those that adhere to Jesus as their Master and Lord. If Jesus exemplified it, then His disciples should be capable of doing it as well. The art of forgiving is a spiritual grace every Christian should develop. Because this is so difficult to put into practice, Roy Smith, an author of bible study materials offers the following suggestions: 1) Begin by assuring yourself that compared to Christ's suffering you haven't been seriously wronged at all. 2) Recall the many kind deeds that have been shown to you, perhaps even by the person who has harmed you. 3) List the benefits you have received from the Lord. 4) Thank Him for blessing you with His love and forgiveness each day. 5) Make an honest effort to pray for the one who has injured you. 6) Go even further by looking for an opportunity to help him. 7) If the offense is especially hard to forget, try to erase the memory by thinking gracious and generous thoughts. 8) Finally, before you fall asleep at night, repeat slowly and thoughtfully that phrase from the Lord's Prayer, "Forgive us our debts, as we forgive our debtors." If I have walked in my own willful way— Good Lord, forgive! Lest I myself should suffer through the strain— Good Lord, forgive! That which I know not, Father, teach Thou me— Help me to live. Learning to appreciate the power of forgiveness provides a secure life of peace and joy. Having no heavy baggage to carry around, an individual will be free as a bird to face anything it may encounter. 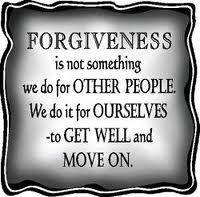 It is a great advantage to ensure that forgiveness is an attitude to adopt at all times however small the issue maybe. As the popular saying goes, “To err is human, to forgive is divine.” And it simply means this: Forgiveness of those who have wronged us is very difficult but very Christ-like. When those that professes to be Christians applies the power of forgiveness at all times in any situation, many will see Jesus and become attracted to Him.